We now sit a week after MegaCon Orlando 2017, and the whirlwind events that surrounded it have now had time to settle in my thoughts. In many ways, it was a very cathartic event, and one I feel will have great significance in the history of Red Giant. It truly cemented for us that we are indeed now on the right path. For those who don’t know, MegaCon Orlando has grown to become one of the largest comic book and pop culture conventions. And while it has been in the hometown for Red Giant, we had never really had a booth. Typically, David and I would simply take the time to visit old friends from the business, see what is new, take our kids, and have fun. We are, after all, still fans of this business that we love so dearly. Two things changed, however, for us this year… a new direction and new show management. 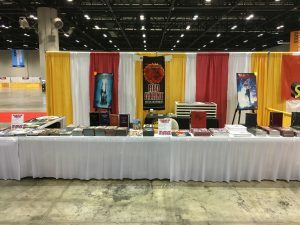 In the past, we had never really gone to fan conventions for Red Giant beyond San Diego Comic-Con because with the Giant-Size line, our goal was to provide free comics which would invariably find fans. 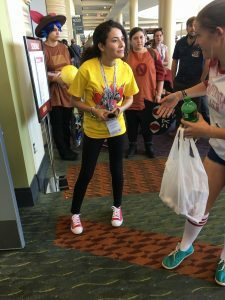 Conventions can be incredibly exhausting and time-consuming events, with little direct financial payoff for our then-business model. Now with the advent of Absolute Comics Group, however, this dynamic has changed great. We now are going a more traditional route in many ways, and that means interacting with the fans on a local level to help build a paying audience. Further, we need to reach established and budding artists and creators to expand our line. That means going to comic cons more often! Also, we had heard that MegaCon was under new management and there was a lot of good industry buzz about this. A company called Fan Expo HQ out of Canada had taken over the reins of the event. A quick email to them and we were instantly well received and treated exceedingly well. Over the years I have attended and exhibited at a large number of shows, and I can say that the level of professionalism, courtesy, and support given by the staff was beyond compare. Based on their work, I can say I would be proud to be part of any show that they conduct for as long as they’ll have us. Mind you, I mean this as no disrespect to the previous management of MegaCon. It was a fine show to attend, but beyond that, I had no frame of reference. I can say that this year seemed to be the biggest one I had been to. Arriving at our table, I could not have been more pleased. They situated us in one of the main aisles, right near the front doors to the north entrance! We were also wedged between the celebrity signing areas and the “Back to the Future” DeLoreans with a curtain between both sides. This meant people coming down this main aisle would not be distracted and could see us right away. In short, our booth was busy nearly non-stop. I can count the lulls on all four days of the event on one hand with fingers left to spare. What was especially gratifying was not just the new readers we were able to acquire, but the established fans who would visit to talk to us about the impact our work had on them. For instance, one gentleman was quick to tell me about how much he enjoyed Typhon, a dragon character from Wayward Legends. He went so far as to let me know he plans to have the character made into a rather large tattoo! This floored me. Someone likes my creation enough to use the real estate of his own body to permanently display the character for the rest of his life! And this type of fan encounter occurred more than once across the table. Another goal for the show was taking the time to break away and talk to the other creators about joining our “creators” line for Absolute Comics Group. To say we were met with enthusiasm would be an understatement. There will likely be several projects to come from this show alone, and if nothing else had occurred, that would have been a big win. 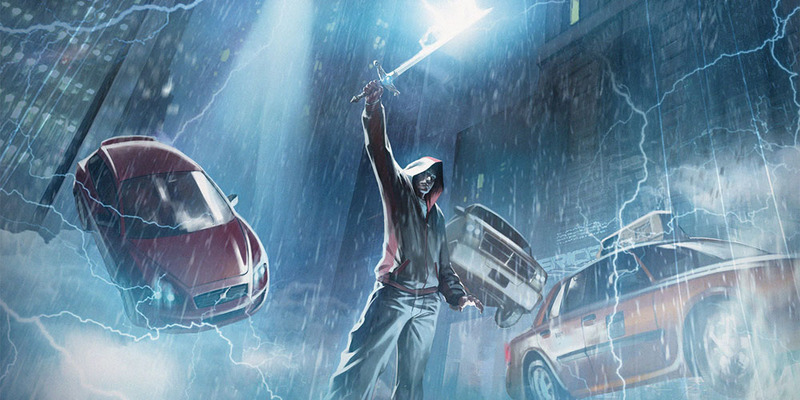 In keeping with that theme, on Saturday, David and I hosted a panel to discuss the topic of “Breaking into Comics the Digital Way.” When the good folks at Fan Expo HQ asked if we would be willing to do a panel, it was the topic I felt we could do that perhaps would be unique and maybe appeal to a few people. To be honest, I went up to the panel area a little early to see if we had anyone even there at all. Dave and I half expected maybe a handful at best. So, I was understandably shocked when I saw not one, but three massive lines outside the doors waiting to get in. When I asked the girl at the front of the line if this was the right topic, she quickly told me it was and the, “back of the lines are over there…” Needless to say, I chuckled that she was here to see me but thanked her all the same. Thus, David and I were able to give what we felt was a practical step-by-step hour-long discussion on the ins and outs of breaking into comics as a creator in the digital age… as well as a look back at how things used to be when he and I started out decades ago for DC and Marvel respectively. We concluded the discussions not only explaining that Powfolio would be a great venue for these budding young talents, but revealing Absolute Comics’ creators line as an option as well. We sincerely hope to hear what fruit, if any, comes from the seeds we planted. But judging by the dozens of young creative talent that stopped us outside and came by our booth, I think it’s safe to say we were helpful at the very least. All in all, MegaCon Orlando 2017 exceeded our expectations. It was an amazing experience and we couldn’t have asked for a better kickoff to this new chapter for our company. We are reinvigorated and ready to tackle the future… onward and upward! Sounds like a good time and hope to see results come from it as a shareholder. 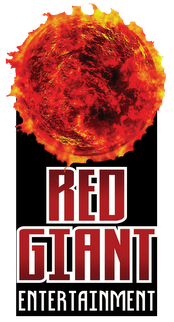 Next PostNext Red Giant Entertainment at San Diego Comic-Con 2017! See us at Booth #5536!